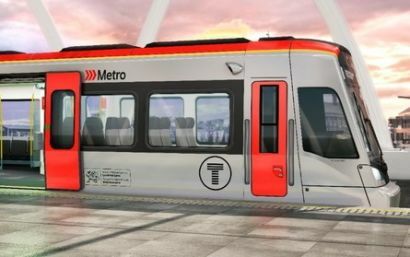 THE Welsh Government has unveiled plans for a new depot to serve the future South Wales Metro. The site at Taffs Well is about 10km north of Cardiff, and the scheme will cost nearly £100 million. When complete, the depot will be the base for 400 members of train crew and 35 maintenance staff, who will look after 36 vehicles. It will also house a South Wales Metro integrated control centre, employing another 52 staff. The nearby station will be modernised and gain a park and ride site. Elsewhere, stabling sidings at Treherbert and Rhymney will also be upgraded, and Rhymney station will be enlarged to cater for longer ‘tri mode’ trains. These tri mode sets will also be maintained at the existing Canton depot, where maintenance facilities will be improved to deal with them. Economy secretary Ken Skates said: “Public investment with a social purpose is right at the heart of our new approach to rail and in line with our Economic Action Plan, and we are determined to ensure that our £5 billion investment in rail services maximises opportunities for Welsh business, stimulates the Welsh economy and develops the local skills base, creating and supporting as many local jobs as possible. Clearance and construction work at Taffs Well is expected to start next year, and the depot should be complete by mid 2022.